Under the cool and wet soil conditions that have persisted throughout most of Missouri this year, injury from preemergence residual herbicides is more likely to occur. This is because corn plants are able to take up the herbicides at a rapid rate but are not able to metabolize or break down these herbicides at a similar pace. Some injury may also be attributable to the herbicide coming into direct contact with the seed as a result of wet soil conditions and/or failure to close the seed row. Figure 1. 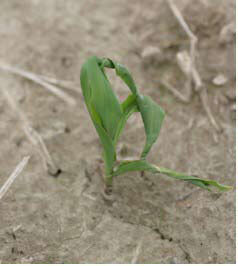 "Buggy-whipping" injury on corn as a result of a Define herbicide and cool, wet soil conditions after planting. Corn can exhibit a variety of injury symptoms at or soon after emergence as a result of preemergence herbicide applications. Herbicide injury to corn as a result of cool and wet soil conditions is perhaps most common with the soil-applied grass herbicides like metolachlor (Dual II Magnum/ Cinch/Stalwart), acetochlor (Degree, Harness, TopNotch), alachlor (Lasso, MicroTech), dimethanamid (Frontier, Outlook), and flufenacet (Define), and also with any of the various atrazine pre-mixes that contain these herbicides (Bicep II Magnum, Lumax, Lexar, Cinch ATZ, Stalwart Xtra, Degree Xtra, Harness Xtra, FulTime, Keystone, Bullet, Guardsman, or Guardsman Max). 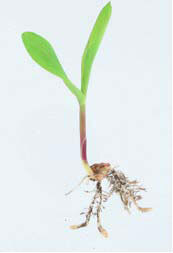 In rare cases, corn seedlings may fail to emerge from the soil and "leaf out" underground as a result of injury from these herbicides. Corn that has emerged and has been injured as a result of one of these herbicides will appear malformed and have twisted leaves that do not unroll properly. This is often referred to as "buggy-whipping" (Figure 1). Fortunately, this injury is usually short-lived and rarely causes yield reductions. Most plants that have been injured as a result of these herbicides will grow out of this injury once soil drying occurs. Figure 2. "Bottle-brush" roots as a result of sandy soils and cool, wet soil conditions following an application of Hornet. Flumetsulam is another herbicide that has the potential to cause injury to corn as a result of cool, wet soil conditions. Flumetsulam is the active ingredient in ython and one of the ingredients in Hornet. Corn that has been injured as a result of Python or Hornet applications may be slightly yellowish (chlorotic) in color and will have both stunted roots and shoots. The short lateral roots are a key symptom of flumetsulam injury, which is often referred to as "bottlebrushed roots" (Figure 2). As with the soil-applied grass herbicides, injury from flumetsulam is usually short-lived and plants typically grow out of this injury once soil drying occurs. Dinitroaniline herbicides such as pendimethalin (Prowl) can also cause injury to emerging corn plants if cool, wet soil conditions persist after planting. Injury from this herbicide is also common when corn seed has been planted too shallow and/or comes into direct contact with the herbicide solution. Perhaps one of the most characteristic symptoms of corn plants that have been injured as a result of pendimethalin is the inhibition of main, and to a greater extent, lateral, root formation. This typically results in short and thick, or "clubbed", lateral roots (Figure 3). Affected corn plants may also have leaves with a red or purplish color around the margins although certain corn hybrids, compaction, or carryover of imidazolinone herbicides may exhibit similar symptoms on young corn plants. Figure 3. 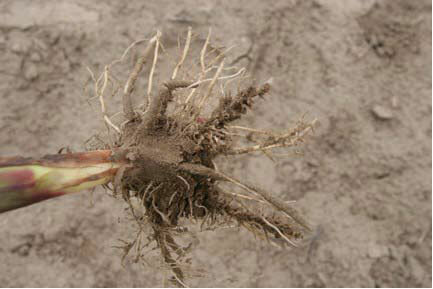 "Root-clubbing" injury on corn as a result of shallow planting and a preemergence application of Prowl. Isoxaflutole and mesotrione are some other preemergence herbicides that may cause injury to corn as a result of cool and wet soil conditions. Isoxaflutole is the active ingredient in Balance Pro and Balance Flexx, and is one of the ingredients in Epic and Radius. Mesotrione is the active ingredient in Callisto and is one of the ingredients in Lumax, Lexar, Camix, and Halex. Corn that has been injured as a result of these herbicide applications will have leaves with anywhere from a chlorotic to a completely bleached-white appearance (Figure 4). Injury will usually appear on the older leaves while new leaves often appear normal and unaffected. Although symptoms of these herbicides are perhaps more noticeable than any other type of herbicidal injury, this injury is usually short-lived and often confined to low areas or wet spots within a field. In severe cases where a high percentage of the foliage has a chlorotic or bleached-white appearance, the plants may eventually turn brown (necrotic) and die. Similar "bleaching" symptoms can occur on emerging corn plants due to carryover of the herbicide clomazone (Command) in the soil solution. Command is not labeled for use on corn, but residues from the previous soybean crop are capable of injuring emerging corn plants when inadequate breakdown of this herbicide occurs. Conditions that favor the carryover of this herbicide include excessive dry periods after application and soils with a pH less than 6.0. Unlike the specific bleached areas that are characteristic of mesotrione or isoxaflutole, carryover of clomazone often results in plants that eventually turn completely bleached white in appearance and die. Although rare, some injury may also occur to corn as a result of misapplications of atrazine or environmental conditions like cool and wet soil that favors atrazine injury. These conditions slow the rate of atrazine degradation considerably, creating some slight injury that is not usually an issue following atrazine applications. Severe rainfall events may also drive corn leaf tips into the soil causing greater amount of foliar uptake than would normally occur. Atrazine symptoms appear as chlorosis and necrosis along the edges of the lower leaves. These symptoms are usually insignificant and transient in nature. Figure 4. Bleaching injury on corn as a result of a preemergence application of Balance and cool, wet soil conditions after planting. Corn can exhibit a variety of symptoms as a result of a mistake made during a preemergence burndown application of a growth regulator herbicide. Some of the more common growth regulator herbicides used in corn are 2, 4-D, dicamba, and clopyralid, but several other growth regulator herbicides are available and registered for use in other settings. Clopyralid is the active ingredient in Stinger and one of the active ingredients in Hornet. Dicamba is the active ingredient in Banvel and Clarity, and one of the active ingredients in Distinct, Status and Marksman. 2, 4-D is sold under a variety of trade names. If a misapplication of a growth regulator herbicide has occurred prior to planting, corn plants can leaf out underground or show symptoms very similar to the chloroacetamide herbicides. Usually this type of injury is due to the planting slot not being properly closed and/or corn being planted too shallow. Each of these scenarios most often causes the herbicide to come into direct contact with the germinating corn seed. 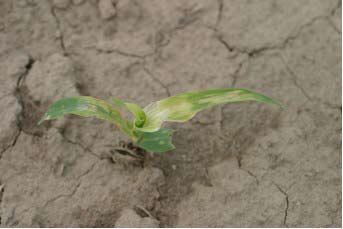 These symptoms can also occur because the proper corn planting rotational interval has not been followed. For example, most 2, 4-D product labels indicate that at least 7 days should elapse between application and planting. Similarly, dicamba has specific rotational intervals that are based on the preplant rate applied. For more information and pictures pertaining to the diagnosis of corn injury symptoms as a result of preemergence herbicides, see the MU publication, Practical Weed Science for the Field Scout (IPM 1007). This publication contains over 60 pages of information pertaining to the diagnosis of herbicide injury symptoms on corn and soybean. More information about IPM 1007 as well as a PDF version of the publication can be found online at http://extension.missouri.edu/explore/agguides/pests/ipm1007.htm.